The valuable work of the borough’s armed forces was showcased and celebrated in a number of events organised by Cheshire West and Chester Council during Armed Forces Week. 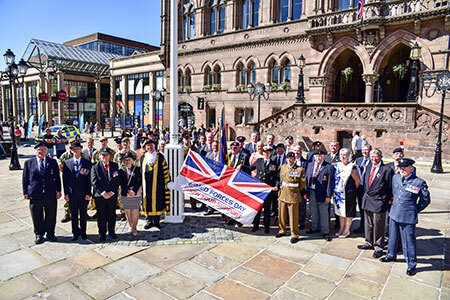 The Armed Forces Day flag was raised by Lord Mayor Councillor Alex Black at Chester’s Town Hall Square to mark the start of the national week to honour the armed forces. Representatives from the Army, Royal Air Force and veterans’ organisations were in attendance at the ceremony. 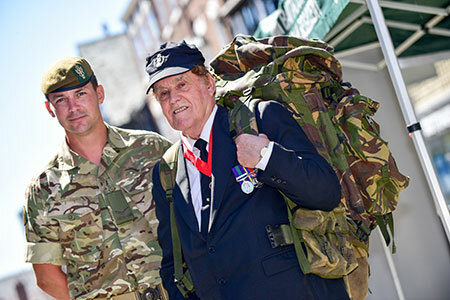 Visitors to Chester also had the opportunity to help celebrate the work of those who give up their spare time to serve their country during Reserves Day on 27 June. The Council invited representatives of 75 Engineer Regiment, 4 Mercian Regiment (Ellesmere Port) and The Queen’s Own Yeomanry to showcase what they do, with displays in the city centre throughout the day. The week was rounded off with displays from the Army Cadet Force and Sea Cadets in central Chester on Armed Forces Day itself on 30 June, raising awareness about these successful youth organisations and those individuals who volunteer as Cadet Force instructors. 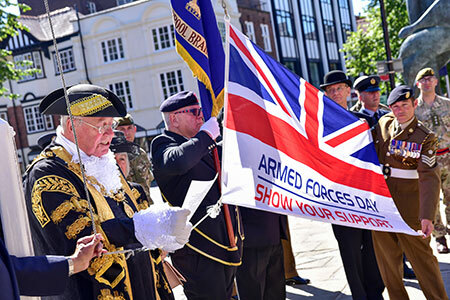 Councillor Brian Jones, the Council’s Armed Forces Member Champion, said: “We organised these events to show our support for the armed forces and to highlight the important work of the reserve forces and our Cadet Force volunteers. “Reservists balance their civilian life with a service career and make a valuable contribution to the nation over and above their day jobs. They have always played and continue to play a key role in our armed forces. During Armed Forces Week, military personnel were offered discounts on free Park and Ride travel in Chester and Storyhouse also organised a 20 per cent discount off any food and drinks.